What Is the Settlement Value of My Truck Accident Case? If you have a serious injury or wrongful death truck accident claim, you want to know how much money you can expect to get from your case. Everyone who has a personal injury case wants to know what their claim is worth. This desire is more pronounced in a truck accident case because the stakes are generally much higher. The settlement money can be life altering. One way to start the process of looking at settlement value is figuring out how much money a jury could award you. In other words, how much money you could actually collect on your best day in court. What people do not understand is that just because a jury comes back with a $20 million verdict does not mean the victim can collect that amount of money. Why? The reason is there are caps on damages. For example, in Maryland, where we handle most of our truck accident cases, the cap on noneconomic damages in 2018 in a truck accident case is between $845,000 and $2,112,500. Why the difference? The cap for $845,000 is the most that any living plaintiff can receive. In death cases, the amount jumps to $1,267,500 million if there is a single wrongful death beneficiary and goes to $2,112,500 million if the victim had more than one wrongful death beneficiary. Keep in mind this cap is for noneconomic damages which is another way of saying pain and suffering. This is why the highest value truck accident cases typically involve a victim who would have made a good salary and would have contributed to his family for many years. There is no cap on economic damages which includes future medical care, future lost wages, and lost household services. What is the Settlement Value of Your Claim? Trucking insurance companies are rarely going to pay the maximum value of your claim if your claim is in the millions. So what you need to do is figure out what your best day recovery would be. Therefore, you must figure out what type of haircut you would give off of that top number to settle the case. Your goal should be to get a settlement higher than that number. But there has to be a number, and if that number is not reached, you file a lawsuit (or go to trial depending on where you are in the process) if the number is not met. The reason for the largest reduction of the maximum value of a case is problems with liability. Which is the risk of getting zero for your case. A simple formula to calculate value is the maximum value of the case multiplied by the estimated chance of success a trial. This calculus hinges, of course, on a good evaluation of the likelihood of success at trial. Most of our truck accident cases at Miller & Zois are not battles over liability, but the amount of damages. The problem in getting good settlement results in these cases is truck companies and their insurers want to get the best deal possible. So they drag their feet. We settled three truck accident case in 2016 that totaled $4 million. The combined pre-lawsuit offers in those cases were $725,000. You typically have to punch these companies in the face before you can get a great settlement and that usually means filing a lawsuit. Another way to value specific cases is to look at settlements and verdicts in other cases. It gives you some idea of how lawyers, insurance adjusters, and juries have valued claims that are similar to yours. Does this mean you can use this to predict the value of your case? No. But they are a useful weapon when combined with other resources and facts. 2016, Oregon: $352,550 Verdict. A 55-year-old female is driving her pickup truck with a kayak on the back. Defendant is operating an eighteen wheel semi-truck when he fails to stop his truck for a line of vehicles stopped due to road construction. The truck strikes two vehicles and then strikes the rear of plaintiff's vehicle, pushing her forward. The truck flips over and spills the gas it was carrying. The woman sustained brain and shoulder injuries, cognitive loss, and post-traumatic stress disorder as a result of the collision. A jury awarded her $277,550 in economic damages and $75,000 for non-economic damages. 2016, Georgia:$650,000 Settlement. Plaintiff is traveling eastbound when a dump truck, traveling westbound, turns left in front of her. The sudden left turn by the dump truck causes a collision, and plaintiff sustains a left hip dislocation and posterior dislocation of the femoral head and a multi-segmented fracture of her hip wall. The parties settle for $650,000. 2016, Oregon:$40,000 Settlement. Plaintiff is a passenger in a semi-truck being driven by her boyfriend that is partially loaded. As they approached a curve in the road, the driver loses control and the truck tips over onto the driver's side, sliding off the road into an embankment. The driver claims the engine compression brake malfunctioned in the truck he was operating in the scope of his employment with the trucking company. The plaintiff sustained injuries to her knee, neck, and back along with a concussion. The parties settled the case for $40,000. 2016, New Jersey:$430,000 Settlement. Plaintiff, a man in his late 30's, was driving his vehicle when a fully loaded dump truck traveling the opposite direction crossed over the center line and collided with his vehicle head-on. The man fractured his hand and wrist, both treated by surgery. He also sustained a left shoulder separation that required surgery. The defendant argued that the man made a good recovery, but settled the case before trial for $430,000. 2016, Florida:$1,400,000 Verdict. Plaintiff is driving her vehicle in the same direction as a tractor trailer on the highway. Suddenly, the truck driver negligently changes lanes, striking her vehicle and forcing it into the guardrail. The woman alleges the tractor-trailer continued driving, but a witness was able to follow it to identify it. The woman suffered from a bulging lumbar disc and aggravation of a pre-existing condition after the accident. She files a claim against the driver and the company, and the driver argues he signaled a lane change and thought he passed the plaintiff, but the plaintiff increased her speed to prevent the truck from merging. The jury found that the truck driver was 15% negligent, the trucking company was 75% negligent, and the plaintiff was 10% negligent. The jury awarded the woman $1,400,000, but both parties have filed post-trial motions. 2016, Washington:$18,500,000 Settlement. A 44-year-old male is riding his motorcycle on an on-ramp prior to dawn. Defendant was finishing up night operations on a widening project in the same area, and a Mack dump truck was pulling a 68 inch pop-up trailer southbound. Without any warning, the same truck made a U-turn across the on-ramp and shoulders in an attempt to go northbound. Due to the darkness, plaintiff did not realize his entire path was blocked until it was too late. He attempted to avoid the truck by applying his brakes hard, and crashed to the ground. As a result, he sustained a severe traumatic brain injury, fractures to all the bones in his left wrist, a fractured jaw, open pelvic fracture, low-back fracture, left leg fracture, and internal damage to his arteries and urethra. He sued the driver and the company, and the parties settled for $18,500,000. 2016, Oregon:$13,921,922 Verdict. A 58-year-old man is crossing the street in a marked crosswalk on a "walk" signal. A garbage truck makes an illegal right turn and strikes the man. His left leg is severed, and he has fractured ribs and chest injuries. He brings a claim against the garbage company and his wife brings a claim for loss of consortium. The company admits liability but disputed damages. A jury awarded the man $3,021,922 in economic damages, $10,500,000 in non-economic damages, and $400,000 for loss of consortium. 2016, Alabama:$2,275,000 Settlement. A woman and her minor son are walking up the hill to get to the shoulder of the highway after their car was forced off the road by another vehicle. A commercial truck strikes them, killing the woman and causing severe injuries to the son. A wrongful death action is filed against the driver of the truck and the company, and defendants deny liability. The parties settle, including $2,175,000 for the wrongful death claim and $100,000 for the personal injury claim. 2016, Massachusetts:$3,500,000 Settlement. A 56-year-old is driving his motorcycle when defendant's waste disposal truck pulls out across the road and into the motorcycle's lane of travel. The motorcyclist attempts to stop by laying down his bike after breaking, but he still collides with the truck. He continues to move after the bike landed, and rolled under the truck. The truck driver does not see him, so does not stop his truck. The rear tires run over the man's head and chest, and he dies at the scene. His estate brings a claim against the trucking company, alleging the driver had restrictions on his license and was prohibited from operating the vehicle. The defendant denied liability, but the parties settled in mediation for $3,500,000 in a confidential settlement agreement. 2016, Pennsylvania:$1,500,000 Settlement. A 65-year-old plaintiff is driving his motorcycle when a tractor trailer negligently enters his lane of travel and pushes him into the concrete barrier. The man dies shortly after, and the parties settle prior to trial for $1,500,000. 2016, Pennsylvania:$10,500,000 Verdict. A woman is driving her vehicle through an intersection when a Mack truck with 50,000 pounds of sand swerved to avoid another vehicle encroaching in the intersection. The Mack truck tipped over onto the woman's car, dumping the sand onto her vehicle, killing her. Her estate alleges that the dump truck driver was negligent, and the truck company blamed the accident on the vehicle encroaching into the intersection that the dump truck attempted to avoid. A jury found the dump truck driver 35% liable, the company who loaded the truck with too much sand 15% liable, and the other driver 50% liable for the crash. They awarded the woman $1,5000,000 in survival damages and $9,000,000 in wrongful death damages. 2016, New Jersey:$875,000 Settlement. Plaintiff, a man in his 70's, is going for his morning walk. Defendant's landscape truck had its lights on, but plaintiff walked into the street when he encountered a spot on the sidewalk with a large amount of debris due to a storm a few days earlier. The landscaping truck struck the plaintiff, and the man suffered a lacerated spleen, fractures and spent the remainder of his life, approximately 10 months, either in rehabilitation centers or hospitals. The defendant driver argued that the man suddenly walked into the road. The case against the driver settled for $875,000. 2016, Florida:$1,400,000 Settlement. Plaintiff is driving an air conditioning repair truck. Defendant is driving a linen delivery truck, and after waiting for a drawbridge to come down, claims he was forced to accelerate his heavy truck to make it over the bridge. However, this acceleration caused his truck to rear-end plaintiff's truck which was stopped for a red light on the other side of the bridge. The collision caused plaintiff to suffer a cervical disc herniation and rotator cuff tear, resulting in three surgeries. He sues the driver of the truck and the truck company, arguing that the driver had plenty of time to stop, had he been paying attention. The case settled before trial for $1,400,000. 2015, Washington:$1,000,000 Settlement. Plaintiff is driving his vehicle when he strikes an overturned dump truck in the middle of the road in the dark. As a result, the man injures his leg and ribs. The truck was overturned, and did not place flares or emergency signals out to warn motorists of its condition. Defendant argues he did not have time to place warnings, as he smelled gasoline coming from the truck, and that the truck has two tail lights that the plaintiff should have seen. The defendant also alleges that the plaintiff was using his cell phone at the time of the collision. The parties settled for $1,000,000. 2015, Washington:$1,200,000 Settlement. A 32-year-old woman is driving her pickup truck on her way to work. A dump/sand truck, operated by defendant, fails to yield the right-of-way and pulls out in front of a stop sign into her path of travel. The woman's truck slams into the side of the dump truck, leaving her with a fractured ankle and wrist and a knee injury. The parties settle for $1,200,000 before trial. 2015, Alabama:$75,000 Settlement. Plaintiff is driving his vehicle when defendant's truck and utility trailer became separated. The utility trailer breaks off from the vehicle, causing it to collide with plaintiff's vehicle. As a result, plaintiff suffers injuries and loss of income. He files a claim against the driver and the company, alleging negligence in failing to properly secure the trailer. The parties settle for $75,000. 2015, Louisiana: $1,100,000 Settlement. A woman is driving her Dodge Caravan on the highway with her two minor children as passengers. Defendant is operating a Mack Truck near an intersection with the highway, but he fails to stop the Mack truck at a stop sign and collides with the side of plaintiff's vehicle. Due to the collision, the plaintiff suffers injuries to her spine, shoulder, arm, hands, ribs, head, and face. Her children sustain injuries to their heads and brains, legs, and faces. She brings a claim against the truck driver and the company the driver was employed for, asserting negligence resulting in the injuries. The parties settled the case with one child recovering $300,000 and the other child recovering $800,000. 2015, Florida: $184,225 Verdict. An eighteen-wheeler, loaded with pavers, rear ends plaintiff's vehicle. The impact caused a disc herniation to the plaintiff's lumbar spine, and a jury awards the plaintiff $184,225. 2015, Pennsylvania: $1,038,000 Verdict. Plaintiff is traveling in the left lane of a highway. Defendant tow truck had just been in the grassy median. As plaintiff approached the scene when the tow truck was, he struck the rear of a tow truck negligently parked in the left lane of the highway without any warning lights activated. The force causes his vehicle to spin into traffic where it is struck by another vehicle. The man is thrown from his vehicle and his injuries are fatal. His estate alleges that the tow truck was negligently parked or stopped in the lane of travel. A jury finds the tow truck driver 30% negligent, the tow truck owner 40% negligent, and the decedent plaintiff to be 30% negligent. They award the man's estate $750,000 for wrongful death and $288,000 for survival, which is reduced due to plaintiff's comparative negligence, for a total of $726,600. 2015, Massachusetts: $600,000 Settlement. Plaintiff is operating his bicycle lawfully on the road. Defendant, operating a garbage truck, makes a left turn across the path of plaintiff without yielding the right-of-way. The plaintiff's bicycle was unable to avoid striking the garbage truck as it went in front of him, and collided with the truck. The man sustained injuries including leg, arm, and clavicle fractures, degloving injuries to both arms, subdural hematoma, and extensive lacerations leaving scarring on his face. The parties settled after mediation for $600,000. 2015, Illinois: $425,000 Verdict. Plaintiff is driving a semi tractor-trailer when he stops at a red light. Defendant is also driving a semi-tractor-trailer when he rear ends plaintiff. Plaintiff brings a claim against defendant and the company owning the truck the defendant was driving. The defendants admitted negligence but denied causing the plaintiff's injuries. A jury favored the plaintiff and awarded him $425,000. We have achieved real results for our clients over and over again. We have won both at the settlement table and at trial. 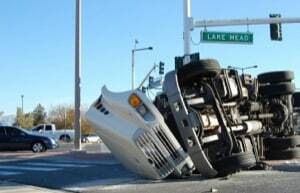 If you have a truck accident claim, call us today at 800-553-8082 or contact us online.